Nomad, in regards of your comment, I am most impressed with Figment, to accomplish so much with a budget of solely $250,000, utilizing the ten principles, with the addendum of the 11th principle of Gratitude, including of Gratitude towards volunteers whom crowd source the events, and the prior events. Might a person desire to pen a guest post in these regards? Except, of any cooperation, collaboration, social networks, or methods of communication of which the BMOrg desires to hide, in the manner of artists making attempts to raise cash not within the control of the BMOrg, or cooperate, or collaborate, to gain a fair contract for the awesome artists. Bloody hypocrites. Ross Asselstine has updated his temple2014.net site, it is most necessary for all artists to view his site. While the artist contract is yet hidden, he, and some of his artist mates, have conversed with the BMOrg in regards of the contract. Ross states manners of the artists, to negotiate with the BMOrg, in the manner of striking statements within the contract, as is most common in negotiations of where gratitude is shown towards the other persons. In addendum, of a tweet from the GLC, by appearance, in regards of the insurance of 2015, it is near to as horrible as within 2014. Might no insurance company desire to provide insurance at a most reasonable cost, and the BMOrg not desire to pay cash to provide the insurance towards the awesome artists? In regards of transparency, this is an example in regards of a 501(c)3 whom desires to provide transparency towards donors. KaBOOM is an awesome 501(c)3 whom constructs numerous playgrounds, has published their signed and audited 2014 financial statements, and publishes their 990 forms within May of each year, when the 990 form is due towards the U.S. government. The BMOrg has their signed and audited 2014 financial statements, of which, it will never be published, and the 990 form 2014 of which, the BMOrg will be send it to the U.S. government after a 6 month delay, within November of 2015, and solely published within January 2016. In addendum, the BMOrg requires of all the regionals to publish their event financials, excepting of the amount of cash sent towards the BMOrg, but the BMOrg, in a most hypocritical manner, refuses of publishing their event financials. The Burning Man Project board is of the power to vote to require of the BMOrg to publish their signed and audited 2014 financial statements, and to require of the BMOrg to send and publish their 990 form of 2014 by the date of which the form is due within May 2015, and require of the BMOrg to publish their event financials, in the place of hiding this information from donors of cash, stock, labour, and art. The BOrg shows little to no evidence of Gifting, which is consistent with an NPD management style. To use your example of insurance, a true gift would be to negotiate a blanket insurance policy for the artists, and then grant them the insurance premium as a gift. That would be cool, as would be the removal on NPD clauses in the very UN-transparent secret artist contract. But that is also something I simply cannot imagine the BOrg doing, explained by their NPD supplies being their first goal in all interactions. Awesome comment, Nomad. I laboured for an event whom required of us to have insurance, purposed to protect the organization, but, the organization did, in actuality, pay cash for our insurance. My belief it is most appropriate, and most common, to do so. But, there are givers within this world, and there are takers, of both cash, and of the ego of power and control. I am most shocked in regards of 35 thousands of likes, and 5 thousands of comments, in regards of a mutant vehicle, of which, some person must construct, to whom we might owe much Gratitude. Kudos, burnersxxx, in regards of constructing a site, of which, so many Burners, and possible Burners, follow, as your gift towards the awesome Burner community. Gratitude. There are numerous festivals and events, of which, are in due of the Burner community. Might you imagine the awesomeness, might 2 or 3 control freaks retire towards the sidelines, in the place of doing their Bait and Switch, and return the Burning Man event, and Burner culture, towards the artists, and towards the awesome Burner community? That is the manner of which Burner culture is spread, not of the top down control of an awesome bottoms up, crowd sourced community and festivals. I was not requesting of you, Nomad, to pen a guest post upon Figment, but, others might pen guest post upon festivals from the Burner community, in the manner of Figment, Lightning in a Bottle, Lucidity, Ignight, Flame Festival, the DoLabs, the Further Festival of Robot Heart, and so many more. The awesome crowd sourced Burner community might spread so much Further, might the 2 or 3 ego driven control freaks get out of the way. Gratitude towards those whom, in actuality, throw the events, is most important. Cheers! I am shocked too. The Combi van post is truly going viral, it has been seen by more than 7 million people, liked by 350,000, generated 71,000 comments, and shared by 80,000. By far our biggest post ever. I am going to let it play out a bit more then will do a story about it. Then back to regular BM coverage, sadly more bad news than good. OMFG! Within instruction of futball, it is most important of 4 compliments for each instruction. Perchance, for good news, might others pen posts upon other awesome festivals, art projects, and events purposed for the awesome Burner community? There is so much beauty and awesomeness within the community. We need a web site dedicated to listing all burn-type events, regardless of BOrg affiliation. There we could have sections to discuss each event, as well as the aspects to compare and contrast them, and a summary table of various factors (date, location, cost, financial transparency, paid staff, volunteers, opportunities for involvement. If you want a festival where contributors get paid, start one. That’s not Burning Man. Volunteerism isn’t an artifact or a financial scam…it is the point of the thing. Yes, free labor is what it’s all about, so the people at the top and run to the bank with most of the revenues, and hang with their new Davos-wannabees. But if you want an arts experience created AND managed by volunteers, then go to Transformus, Ignite or Figment. Those are events where the volunteers are valued, not exploited. Why do you constantly make false statements and lies of omission? It is as if you might be a political hack, stating ‘facts’ might the ‘facts’ contain enough truthiness for some people to believe, then, when that fails, you repeatedly state we have no proof all the while you ignore the numerous linked sources, then, when that fails, you falsely attack the messenger, then when that fails, you bellow louder and continue with your false statements and stay upon your message. You know that Burners.me is a news, news analysis, and opinion blog site, yet you refuse to admit that the news and analysis and opinion is supported upon the numerous linked sources, the ones in blue, yet, you constantly falsely state that we are bloody liars, when you have no proof, in the least, of any intentionally false statement. The numbers are either the numbers of the BMOrg, or from simple maths upon their numbers. Opinions, and estimates, are most obvious to be opinions, and estimates. Any person is most free to comment, of an intelligent manner, in disagreement, and link to their sources in the manner of we constantly link towards our sources and background information. You know that Larry was not truthful when he stated ‘It has been asked if we intend to reveal the financial records of Black Rock City LLC. The answer is yes; that too will happen at about the same time as the Burning Man Project reveals its information—these two entities will then become a clean well-lighted suite of rooms thrown open for inspection.’ The $30.5 million of financial records of Black Rock City LLC, dba Burning Man, remain hidden, that is the purpose of this post, but you refuse to admit of that, you constantly falsely state of that the financial records of BRC LLC have been released. In addendum, the Reno Gazette Journal requested the hidden financial records of the BRC LLC, the RGJ was told to wait near to one year. You know that their cash out has nothing, of the least, to do in regards of the small cash they received upon their honourable donation of the BRC LLC to the Project, of yet, you continue to falsely state they took towards their pockets solely $46,000 of each for their cashout. You know their cash out started within 2010, their stated raise of payroll from $2.8 million within 2009, to $7.2 million within 2010, while they stated, to the sfpublicpress, of they had solely 30 employees to move to the Market Street building, states so, $4 million is missing from their stated payroll number, click on this link. You continue to utilize the false straw man term of ‘corruption’, when no person, of other than Larry, or a drinker of their coolaid, has utilized the false straw man term of corruption.. I have never made a false statement, by intentions, everything I ever stated is linked from sources, or an estimate made within good faith. I never stated anything other than they donated their BRC LLC to the Project, but you continue to falsely state I intentionally lied in regards of the cash they received in due of this donation. You know their cash out is the millions they took towards their pockets prior to their honourable donation of the BRC LLC to the Project, their reasonable salaries after their donation of the BRC LLC to the Project, the hidden amount of cash they are, by present contract, to take towards their pockets for the Burning Man(TM) trademarks and other IP, and, perchance, hidden income streams and hidden ventures. I apologized in regards of being high within my estimates upon their tax deduction upon their most honourable donation of the BRC LLC to the Project, and the cash they are to gain for the Burning Man(TM) trademarks, but what is the rationale of that they took nine months to respond in regards of the estimate? It is the time for you to apologize for your numerous false statements. The best manner of you to apologize is for you to halt making your false statements. Why do you continue stating information you know is false and numerous lies of omission? You have viewed all of these posts and know this to be so. It is not much of an apology. ‘accultured’ manner? What occurred within 2014 of that these camps donated solely a trifle of cash? By appearances, the donation program is most successful within 2015, Crimson, and Marian, by appearances, are most happy in regards of the donations, purposed for art, support of the costs of the Project, and, perchance, hidden ventures, might this be so? Might donors requesting of transparency in regards of the hidden BRC LLC financials be halting the donations programs from gaining as much cash as might be desired by the BMOrg? Might it not it be most proper to advise the BMOrg to provide the desired transparency on the BRC LLC 2014 financials, to halt hiding the BRC LLC financials, and, perchance, disclosure of conflicts of interests towards donors? What was the profit, of the BRC LLC, the Burning Man event, within 2014, that was gained by the Project? Of the 3 new fund raiser positions within the BMOrg, might one of these positions be you, within a part time manner? Or, perchance, in the place of answering these queries, you might halt with your false statements and numerous lies of omission. Pooh does it because that’s his job. Of course I resigned! The bad press of being associated with the BMORG was starting to affect the marketing for Mirror Mirror (Caravancicle 2.0). The only reason I was on the board was to get tickets, and now that I can register as a ‘theme camp’, that problem is solved without being tied to a bunch of hippy dippy dreamers. Ha! You can’t fool me. That’s just the cover story. Sure, they gave you the CCamp placement for resigning, but they also got to divert attention from who they have put on the BMP BoD. The faithful now get to brag about your resignation when burners ask why they are not represented on the BMP BoD. I’ll give you 10:1 odds that they both have a greater net worth and fewer years at the NV burn than me. And you can bet that she get a check from this time _before_ they get elected to the board. Jimmy did a fyne job of stringing the wannabe 1%’ers along. Jimmy, when did you start referring to yourself in the third person? Anyway, didn’t you already make your contribution to the BMP? If not: well played, sir! You walked away with money by playing the BOrg’s NPD traits, specifically Vaknin’s traits 1-5, 8 and 9 . 1. Feel grandiose and self-important (e.g., they exaggerate the group’s achievements and talents to the point of lying, demand to be recognized as superior – simply for belonging to the group and without commensurate achievement). 2. Are obsessed with group fantasies of unlimited success, fame, fearsome power or omnipotence, unequalled brilliance, bodily beauty or performance, or ideal, everlasting, all-conquering ideals or political theories. 3. Are firmly convinced that the group is unique and, being special, can only be understood by, should only be treated by, or associate with, other special or unique, or high-status groups (or institutions). 4. Require excessive admiration, adulation, attention and affirmation – or, failing that, wish to be feared and to be notorious (narcissistic supply). 5. Feel entitled. They expect unreasonable or special and favourable priority treatment. They demand automatic and full compliance with expectations. They rarely accept responsibility for their actions (“alloplastic defences”). This often leads to anti-social behaviour, cover-ups, and criminal activities on a mass scale. 8. Are constantly envious of others or believes that they feel the same about them. This often leads to anti-social behaviour, cover-ups, and criminal activities on a mass scale. BMorg does not feel accountable in any way to burners. Once in a while they’ll wake Larry up long enough to wax poetic tldr just to keep the Kool Aid bunch toeing the line. They feel they are better than everyone else and that’s supported by all the people trying to desperately to get close to them. Short of the government shutting the Nevada burn down, it’s just going to get more and more ridiculous until something gives in a big way. For the lulz, I’d like to see how far BMorg can push it before they start seeing a decline in ticket sales. Crank the ticket price up to $1k and give everyone the bird about transparency. They still have millions of people dying to go to this thing, the Simpsons episode guaranteed that. Yes, there is no restraint on what they can do with the ticket prices. It’s like ski resorts, who just keep increasing their prices, not because their costs go up, but just because they can. Except, at the NV burn, the skiers bring the snow …and the lifts, the accommodations, the restaurants, and the open bars. All the BOrg provide are the roads, ticket booths, safety patrol (maybe not in 2015? ), coffee (for an extra price) and restrooms. It is sad the BMOrg desires to hide much information from donors of cash, stock, art, and labour, they owe much more information towards donors. The Afterburn Report stated one quarter million hours of labour for the Burning Man event, most donated from volunteer labour of awesome Burners. There is no manner donors of of cash, or of stock, might be able to due diligence upon their donations, the BMOrg hides the answers of the queries of ‘why do you need this cash, how much cash is on your ledger, and, the query of in what manner have you spent your cash?’ Larry promised a ‘clean well-lighted suite of rooms thrown open for inspection’ of the $30.5 million of BRC LLC, dba Burning Man, ticket sales, but this is yet another broken promise, the financials of the BRC LLC subsidiary corporation of the Project are yet hidden from donors. How might any donor do proper due diligence upon a cash donation when the BMOrg hides their signed and audited Income statement and balance sheet, information they require of the regional events to publish. The Burning Man Project board is of the ability to vote to require of the BMOrg to publish this information, but they, by appearances, have not done so. Larry stated that Black Rock City, to be a real city, needed a government, a paper, and a central meeting place, and they stepped forward to be the tasked government. Thank you, burnersxxx, for stepping forward to be the paper, after the BMOrg closed the first papers of Black Rock City in due of the papers reporting on the rubbish of the BMOrg. What other items might the BMOrg be hiding from donors of cash, stock, art, and labour? Larry, within his position of Chief Philosophical Officer, has the ability to review and propose towards the Project board programs, ventures, and joint ventures, with these ventures, and conflicts of interests upon these ventures, hidden from donors. The most horrible artists contract is hidden from the awesome artists, why might any person design art without being of the knowledge of the contract they will be required of to sign? How many millions of cash did the BMOrg direct towards their pockets prior of their honourable donation of the BRC LLC to the Project? By simple maths, near to 4 million is missing from their accounting of each year of 2010, 2011, 2012, and 2013. Why is the BMOrg not supporting the mutant vehicle owners, sound camps, and other camps whom provide entertainment towards their ticket buyers? It might be easy peasy of the BMOrg to gift several thousands of free tickets purposed towards supporting their efforts. What other cash might be directed towards the pockets of members of the BMOrg? I penned a post upon these queries in answer towards a rubbish PR article most incorrectly stating the BMOrg is a leader in transparency. My belief is people representing the awesome Burner community must be nominated to the Project board in replacement of Dr. Tananbaum, and the Project board must vote to require transparency, towards donors, upon the BMOrg. On the point of tickets, note that Dr. Yes, below, used the DSG tix for a brace of virgins – not likely for “mutant vehicle owners, sound camps, and other camps whom provide entertainment towards their ticket buyers.” The BOrg manages to do things sufficiently half-baked that they are less than successful, but they do meet their narcissistic needs. Do you know how Burning Man works? It’s not top-down; it’s bottom up. As I have said many times before, they should make the tickets first available to the veteran burners, using past emails for ticket sales, based on the number of years ticketed. Because… they make the event. And they could decide if others should have their tickets. But that devolves power to the burners, something the NPD BOrg could NEVER do. So, we watch as they dig an ever larger and deeper hole in the playa to bury the last gasps of Burning Man. Just to be clear, I did not use DSG tix for a brace of virgins. The DSG tix went to my wife and I, while the other tickets she and I acquired via the individual sale and the pre-sale were sold to the birgins we’re bringing who were without. That’s not what I see in the community at all. Do you have numbers? As anecdote, for instance, I’ve got a group of five virgins I’m taking this year – none of them managed to get tickets in the individual sale. I did via DSG. As far as I can tell, it was much easier to get tickets if you’re a veteran as you’re more likely to be in the DSG sale. Dr. Yes, did you get a code for the individual sale? If so, you filled out a profile where you disclosed if you were a virgin. 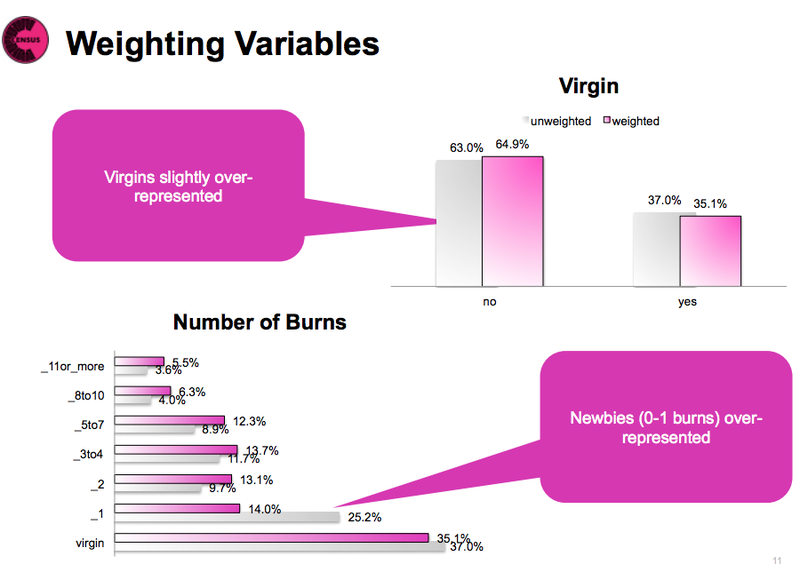 The theory is that virgins were given preference in either receiving or processing the codes, leading to their 40% presence in the BRC census. And, that the BOrg prefers virgins because they are easier to satisfy and less likely to complain – and easier to join in the cult approval crowd. But they are also more likely to be spectators, moochers and bike thieves. Interesting that you used the DSG, intended to bring veterans to BRC to keep up the interactive/entertainment aspect of the event, to bring in a brace of virgins. The concern is for the dilution of the spirit we had 10 years ago when I attended: virtually no bike thefts, no narcs, walk-up ticketing, and a family community with rare spectators. When I first went I learned from those around me, who were mostly all veterans. It would be weird to have 2 in 5 people on the playa be a virgin. This leads to a crowd behavior that does not reflect the positive veteran experience, and over time that feeds on itself into a different community. The NV burn has devolved into just a bucket list festival; it is not Burning Man. Burning Man happens elsewhere. See above. I certainly did not use DSG tickets for anyone but myself and my wife. Worth noting though that DSG tickets are not for veterans explicitly – they’re allocated to veteran camps, some of whom may have many birgin members. I’m also not sure why the panic over 40% of the people being birgins. That was the norm during the years Burning Man became big. It was an absolute minimum of about 50%+ birgins for years during parts of the 90s when the event was at least doubling in size every year. And those are just the absolute minimums. The real birgin percentage is certainly higher than the bare minimum possible to be gleaned from those numbers. You said, “I’ve got a group of five virgins I’m taking this year – none of them managed to get tickets in the individual sale. I did via DSG.” If they did not get the tickets by individual sale, where did they get them? Sounds like it was DSG. Unless you have additional information to offer, your birgin analysis is not clear. Does it presume “birgins” have been there less than 5 years? Or, do you presume no one comes back? And 1 out of 2 people on the playa are virgins or have only been once. What type of community legacy does that foster when there are twice as many people there. That would be like the 2005 burn inundated with twice the number of virgins, or worse. Nope, the proven burner spirit is unquestionably being diluted by the ticketing, and commodified by the BMP. I don’t read anything in here but a bunch of hyperbolic vitriol that doesn’t do anything but rile up people who don’t know better. Oh, wait – it’s easier to complain about a strawman at the org which is really just the inevitable bureaucratic sludge that accrues when you try to hold an event of 70k people on federal land. Rather than eliminating loyal volunteers, some paid positions are in place to create accountability where once there was none. Anyone living in the same reality as the rest of us would know that. While I feel bad about the workplace injury, I don’t feel responsible for it. We have definitely helped raise funds for other needy Burners in the past. Don’t you think it should be BMOrg’s responsibility, not Burners.me? BMOrg no longer publish financial information in the Afterburn report. They promised transparency, and instead dropped something they’ve been doing for 12 years. Doesn’t that rile you up? I understand that you don’t feel responsible for it, but I was rather shocked you didn’t post an expose with a link to the funding campaign for the ranger who was blinded. I assumed you would have gotten all the mileage possible out of “A volunteer was injured at the burn, and they have to pan handle to make ends meet. Where’s the BMORG when it comes to taking care of its volunteers?” while still giving the poor girl some link karma. I mean… Really?! Who could possibly believe this? As you say, it is all just made up to rile up the readers. What is more patently absurd than the BMP BoD, made up of people who don’t represent the event, in charge of promoting and spreading the word of the event. Doesn’t pass the smell test. Awesome post, burnersxxx. Thank you for providing independent reporting, in a U.S. first amendment manner, backed by links and sources, on this rubbish. Many items are to commented on, I will start in regards of the census. The people doing the census are most honourable, kudos to them for awesome censuses within 2012 and within 2013, with the self reported numbers weighted by querying, in a random manner, the burners waiting within the gate queue of both burns. I do not believe the 2014 census numbers of burns prior to 2014 page is correct. The 2013 census stated solely 14 per cent of BRC had 5, or more, prior burns. The 2014 census states 24.1 per cent of BRC had 5, or more, prior burns, 7,000 more burners of 5, or more prior burns. This did not occur. Experienced Burners had many difficulties obtaining tickets, and many halted venturing to the playa in 2014 in due of the BMOrg rubbish, and in due of many of their mates not obtaining tickets. The number of burners of 5, or more, prior burns did not raise from 10,000 burners within 2013, to 17,000 burners within 2014. The prior 2013 census was weighted by queries within the gate queue starting on the Wednesday of build week, purposed to raise the numbers of experienced Burners from the numbers of 2012. But, the numbers of 2013 were near to the same as the numbers of 2012. I am most curious in regards of might the BMOrg discussed of their PR desire of showing larger numbers of experienced burners on the playa, and queried the Census people as to manners to show the BMOrg desired numbers within the 2014 census? Viewing the census again, it is most apparent that the census report of the number of burners with 5, or more, prior burns raising from 10,000 within 2013, to 17,000 within 2014, is utter PR rubbish. The 2014 census is most incorrect. By first approximation, and to a statistical level of certainty, the BOrg has that data from names and emails from ticket purchases. But instead of dealing with real data, they do the “census” survey thing, which can be manipulated in a way that the data cannot. Once you understand NPD, you can see that veracity is their enemy; all must be carefully manipulated perceptions. The whole “transparency” thing is an ironic example. They know people want transparency, so they promise it, even claim to deliver it, all the while actually making things all the more obscure. 1. In additon to the $/ticket that go to the artists, show the % of the ticket price, or % of tickets+passes, or % of total revenue. 2. Unless things have changed, an “interative element” apparently is having an open bar one evening during the week. Nomad, might you desire to wager that the “interative element” of the Concierge Camps is much more than apparently having an open bar one evening during the week? I might desire to wager that, for 2015, the interactive element of the Concierge Camps will build upon the Cirque Gitane Circus. Cirque Gitane was a K street Billionaires Row Camp within 2014 whom made attempts to provide a circus. Might the Concierge Camps, as Larry and the Afterburn Report term them, be labouring with each other to provide a circus for us Chumps and Suckers? If this is so, I desire the Burners whom perform for them be paid handsomely, perchance a free ticket, near to $2,000 each, and paid insurance for their awesome circus acts and fire spinning for the Concierge Camps. Nomad, might you desire to wager that the rationale of Larry selecting the theme of Carnivale, a Circus, for 2015, was in due of his Concierge Camp mates desiring to do a circus as their interactive element? I was going with Jimmy’s pathetic complaints of their “interactive” element in his story. Since, at the time, he was hanging with his BOrg BoD buddies, I presume his story passed muster with them. It was the burners who were pissed, because, well, they were not rich Davos-wannabees, and burners. At the least, some awesome news. Kudos on finding the BMOrg is raising the artist grants, one might desire that they have raised payments towards a much higher per cent of the costs of the artists, including of the temple, and not requiring of the temple to raise $200,000 to $300,000, as was commented prior. Hand held lasers are banned, the BRC Rangers would not have protected wankers from the burns might the BMOrg not done so. In addendum, by a report, might it be true, Plug and Play, or Concierge camps, are not to be permitted. The culture of Burning Man is to labour with your mates to construct a camp, and operate the camp, that is the manner of which burners bond with their camp mates. Radical self relying on cash to pay others to labour for you is rubbish, it is part of the jumping of the shark. I am curious of the manner the BMOrg might do so, might it be all commercial camps must pay the BLM the 3 per cent levy, and the BMOrg will not approve it, or the BMOrg will not place camps that hire burners to labour in the manner of servants, or might the BMOrg request the client list of businesses that must pay the site services levies for the BMOrg to approve of them. “…by a report, might it be true, Plug and Play, or Concierge camps, are not to be permitted.” < Where did you find this? Sounds more like BOrg propaganda to placate the faithful and obfuscate the facts, than them making a sea change. I’m working on a story based on numbers revealed in Crimson’s speech. We will see if the numbers she used correspond with the IRS filings. BMP’s filings so far make no mention of Honoraria Grants…they were previously treated as an expense item in the Afterburn Financial Charts. Nomad, it was within the GLC twitter. Might Crimson have utilized weasel words in regards to the payments towards the artists, might this have occurred, the BMOrg gaining credit for art grants by the regionals? I do not desire of this to be true, my desire is truly of the BMOrg paid the $1.2 million for the 123 art projects from their ticket sales, with them paying near to all of the costs of the awesome temple. Can’t think of anything better than a tweet to placate the faithful and obfuscate the facts. Hardly the place to announce a sea change in policy. Nomad, and burnersxxx, you are most correct of that it was a statement, and a tweet purposed to placate the faithful and obfuscate the facts. Marian stated near to ‘We intend to eliminate the plug and plays. Big applause. It will take time, but might they not aculture, or participate, we have ways to stop them’. It is solely the same rubbish the BMOrg has stated since last year, the plug and plays, and the Concierge Camps must participate, or the BMOrg will not permit the camp to occur in 2016. They remain permitted to hire others to construct their camp for their paying clients, and hire burners as servants, and the members of the camp are not of the need to do any of the labours, they solely must participate. Within my prior comment, perchance, what Marian stated was near to ‘We absolutely intend to stop the plug and plays. …’, in place of the term ‘eliminate’. Last I heard , BMOrg had a bunch of “docents” whose job was to manage the Commodification Camps, and Rosie von Lila was the main year round plug-n-play liaison. Maybe that’s changed. Or maybe BMOrg tells the audience what they want to hear, since there’s no oversight or accountability and they have a team of shills ready to defend their propaganda to the death. One of our mates stated to us ‘Yes, Coachella jumped the shark, in regards of their headliner of AC/DC in despite of no Malcolm Young or Phillip Rudd. But, at the least, it took Burning Man 20 long years to jump the shark and become an EDM version of Coachella in the desert’. I grow weary…. BMorg continuing actions constitute a breach of trust and bad faith. Not meaning to all Bucky on y’all but it’s time to create the alternative. The future of Burning Man is local. Its pretty sad. If I wanted to go this year, if I didnt get a “poor person” ticket, I would have had to spend roughly $400-$600 just to be able to get in, not including supplies or gas. Remember, almost every %1 outlaw motorcycle gang is also a non profit entity. Basically anyone who claims to be a church can get away with it. Its the modern way to keep all the dirty money you make, while paying as little tax as possible.